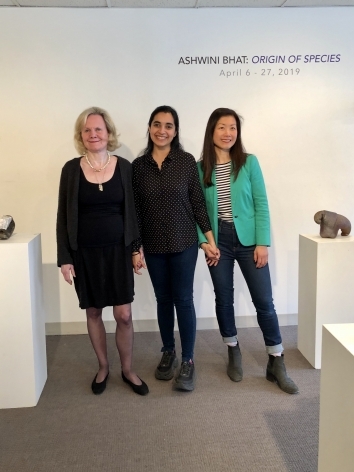 Lacoste Keane Gallery announces its upcoming solo exhibition Ashwini Bhat: Origin of the Species, April 6 – 27 2019, in which the ceramic artist continues her exploration of form to emphasize the relatedness of humans to all beings, challenging the assumptions of species hierarchy. 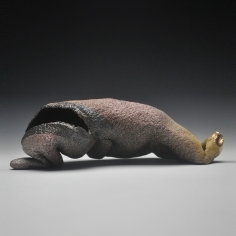 With a background in professional dancing, Bhatuses her dancer’s sensibility to make contemporary sculpture that flows like an extension of the body. 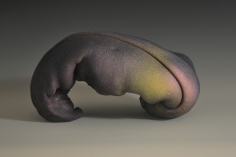 This exhibition is comprised of 5 series: Alive, her newest body of work speaks to the title of the show with its sensual shapes; Origin of the Species: three large anthropomorphic sculptures that can be animal or human; the Beginning of the End, curling ribbons of clay; Ghost Prints2-D prints in clay which remind viewers of fossils; andGarden of Earthy Delights: small scale sculptures incorporating found clay nests from mud dauber wasps. 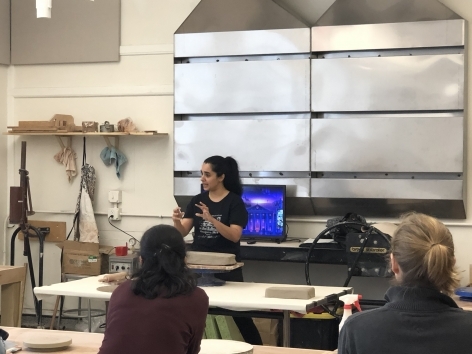 Ashwini Bhat has a strong connection to Massachusetts, having participated in many collaborative group wood firings at the renowned sculptor Chris Gustin’s studio in South Dartmouth. 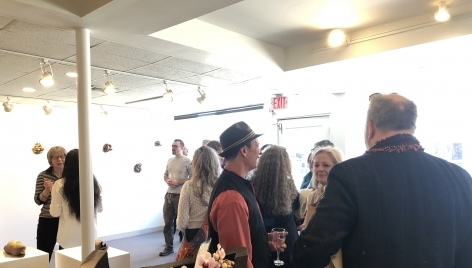 Her solo exhibition at the Newport Art center in 2015 was notable. 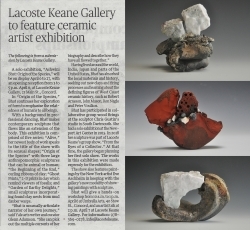 In 2018 her sculpture was an important part of Lacoste Keane’s group show: From the Eyes of a Collector. At that time, we began planning her first solo with us. The works in this exhibition were made expressly for this exhibition. 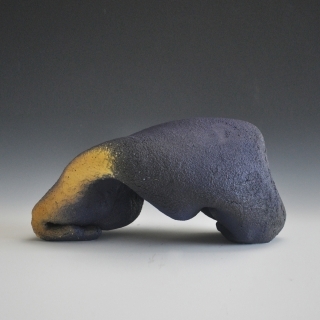 Color is an important element in this new body of work; in some instances, it was applied post firing. 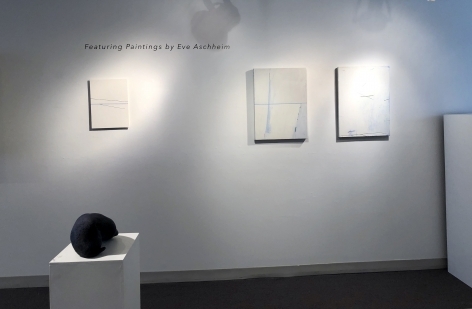 The show also features paintings by the New York artist Eve Aschheim in keeping with our new modality of showing paintings with sculpture. 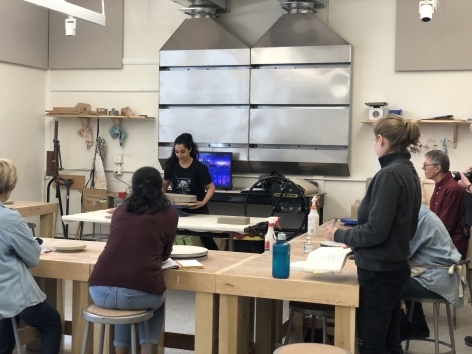 Ashwini Bhat will give a hands-on workshop at Umbrella Arts, Concord MA Saturday April 6, 10 am –1 pm and an Artist Talk at Lacoste Keane Gallery Sunday April 7 at 2 pm. For details call 978-369-0278 or email info@lacostekeane.com. 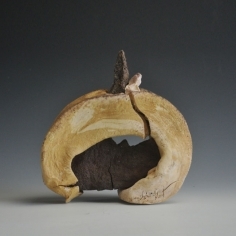 The artists Ashwini Bhat and Eve Aschheim will be present at the opening. This body of work, comprised of five serial sequences— Origin of Species; Alive; The Beginning Is the End; Ghost Print and Garden of Earthy Delights— provokes reconsiderations of our assumptions about human nature. Although the animal kingdom arose from single-celledancestors through an evolutionary surge of genetic material, more than fifty percent of ourgenome, the human genome, is shared with very first animal. Many contemporary conflictsderive from distinctions we insist exist between races, between animals and humans, and between ourselves and others competing for the same resources, but the genetic pool emphasizes our relatedness, how much we have in common, blowfish and ballerinas, gila monsters and gurus. The show introduces radical but somehow familiar forms that ask us to re-examine Western assumptions about species hierarchy. We encounter a bestiary in which traces of the human and traces of the animal linger in imagined bodies on the brink of being born. 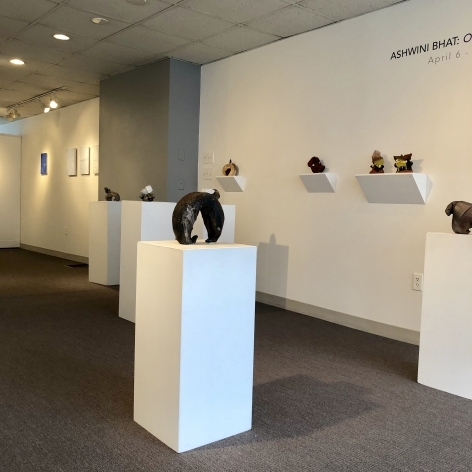 In order to explore the deep relationship between the human and non-human, between the constructed and the inherent, I continue to expand my technical approaches to surface, shape, and composition. 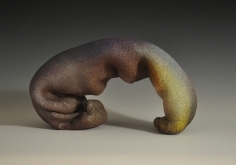 After firing, I cold-finish sculptures using an array of techniques including spray-painting, glass and garnet amalgamation, and sandblasting in order to build out layers, to accentuate the complex connection between the sculptures and the body in transition between recognizable incarnations. 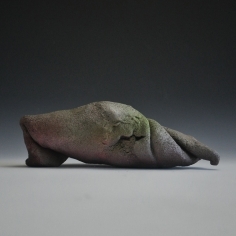 The work, begun in long-term reflections on the interdependency of species, incorporates earthy material that is fired and subjected to various post-firing processes. 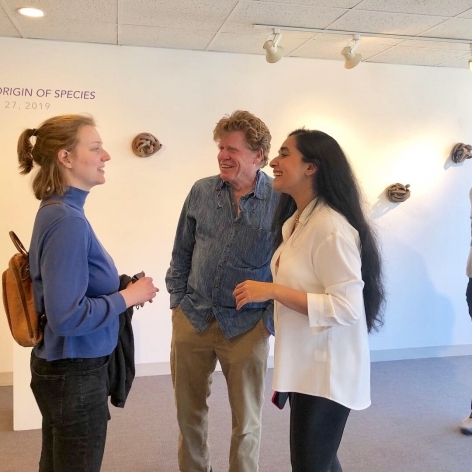 The exhibition integrates my sense of our current environmental exigency, recent genetic science asserting the relatedness of earthly life, and a philosophical and ethical concern for the implications of our conjunction and commonality. Writer and Curator, current Senior Scholar at the Yale Center for British Art. A few years ago, Ashwini Bhat was at a residency in Appomattox, Virginia – the place where the Civil War ended. The place had a strangely apocalyptic feeling. Rain poured from the sky. She had no cell phone service. And when she waded out into the muck to dig up clay, she was attacked by mud dauber wasps (“they are interested in the same material I am,” she thought). Actually, she was very happy there. She was close, so very close, to nature. Bhat gathered things on her wet walks, filling up her jacket pockets and accumulating interesting piles on the corner of her worktable. When the wasps’ nests fell from the trees, abandoned by their former residents, she would fire them in thekiln. 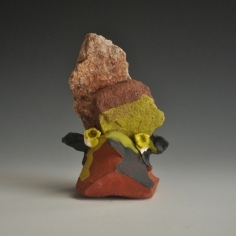 She found chunks of feldspar and other constituent materials of her ceramics and fused them into her sculptures. These works seemed mineral, animal and vegetable all at once. 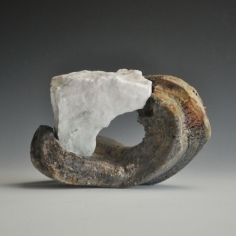 Indeed, while you can see flashes of historical precedent in her oeuvre – not just the swaggering protagonists of the California clay revolution, but also the quieter pots of the Japanese tea ceremony tradition, and a fistful of abstract sculptors ranging from Brancusi to Benglis – Bhat is clearly establishing herself as a new voice in ceramics. It is a voice that sings in several registers. She divides her work into five distinct series, three of which are entitled The Beginning is the End, Garden of Earthy Delights, and Origin of Species. These titles seem to chart a cosmological history in miniature, from the Biblical (“in the beginning was the Word…”) to the humanist turn of the Renaissance, embodied in Hieronymus Bosch’s famous painting, to the paradigm-shifting insights of Charles Darwin. Bhat thinks of her various series as in continuum with one another, as different facets of a single project. Even so, each has its own identifiable idiom. Most recently Bhat has developed a new series, titled simply Alive. 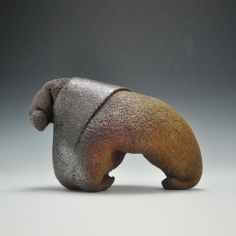 Though not explicitly figural, these objects have a potent animate quality – one can almost imagine them breathing. They curl into themselves, folding like soft bellies, or arch upwards like yoga practitioners into taut curves. It’s not difficult to see Bhat’s background in dance in these works, the way that a performer constantly shapes her own internal shapes in space (“from the head to the outstretched fingers, through the armpit – the armpit is super important”). She further brings out this choreographical sensibility in a series of photographs in which she interacts with the pieces, perching them on a shoulder or a knee. 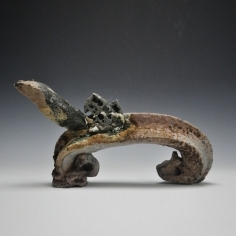 Origin of Species, also recent, is Bhat’s most creaturely series, a set of abstracted figures standing upright with protuberances suggestive of feet, ears, and antlers. They communicate strong presence with remarkable economy of means, telegraphing the idea of primordial ur-creatures, prior to evolutionary genetic lineages, and the divergence between humans and other beings. In addition, because they so reductive in their palette and shape, these works give the viewer a chance to appreciate the rich textures of Bhat’s work – though they lack the strong polychrome of some of her other work, they are nonetheless richly colored. These are achieved over several firings (in both wood-fueled and electric kilns), with occasional doses of sandblasting or other alteration. Despite the attention she lavishes on these surfaces, they have an intuitive, even strangely inevitable air about them, as if they were (as the title implies) evolved through purely natural selection. This image, of descending into mother earth, seems to capture something essential about Bhat’s sculpture. 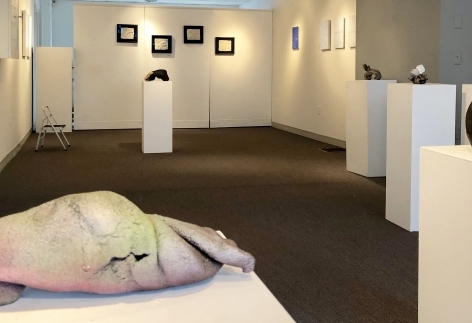 She aims to connect with color, texture and materiality in a completely unmediated way, and then to stage that encounter for the viewer. In some ways that is a familiar idea. Traditional potters in Japan sometimes even talk about the “taste of the clay” (tsuchi aji), meaning not just how it feels in one’s mouth, when drinking from a teabowl, say, but its character, what it seems to want. Bhat is no traditionalist – one look at her work tells you that she is actively in dialogue with the latest currents in contemporary art. But she has deep respect for her material. Clay does indeed come alive in her work, and it has much to show us – if we are ready to see it.